Saturday, May 6 and Sunday, May 7 from 11:30 a.m. until 3:00 p.m. 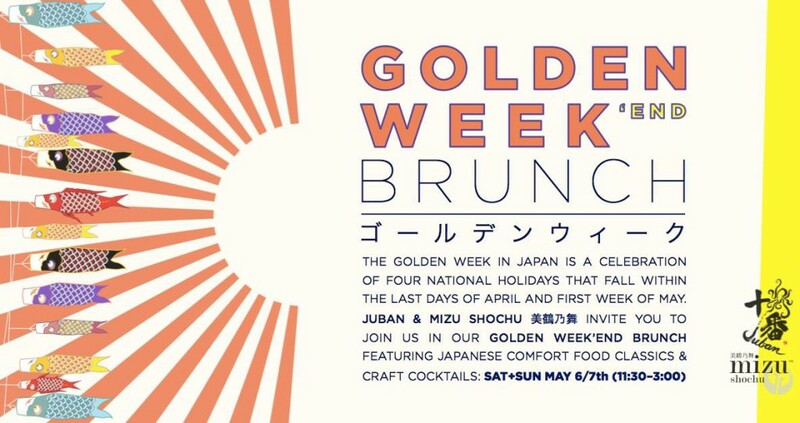 Celebrate the end of Golden Week with Juban and Mizu Shochu! Golden Week is a weeklong vacation in Japan consisting of four holidays, beginning with Showa no Hi on April 29, the birthday of Emperor Showa (Hirohito), who reigned from 1926 until 1989. The other holidays are Constitution Memorial Day, or Kenpou Kinenbi, on May 3, which commemorates the constitution of Japan and the country’s renunciation of war; and Greenery Day, or Midori no Hi, on May 4, the day the Japanese honor nature; and Children’s Day, or Kodomo no Hi, a day that the Japanese pray for the health and happiness of children. To honor this tradition, Juban and Mizu Shochu are teaming up to offer Japanese comfort food and craft cocktails. The brunch specials include Kobe Hambagu ($19): Kobe beef hamburg steak with a demi glace sauce of shimeji and maitake mushrooms, truffle, and onion topped with a fried egg; and Blue Crab Fried Rice ($16): Wild-caught blue crab, shishito peppers, and onion in fried rice heaped over a base of egg-drop soup. The cocktails ($11 each) are Pen-Pineapple-Coco-Pen: Mizu Lemongrass Shochu, coconut water, pineapple juice, and lime juice shaken in a haiball; Arita Marg’Arita: Mizu Saga Barley Shochu infused with shishito peppers and jalapeno, Blanco tequila, jalapeno agave, and fresh lime juice; and Office Flower: Mizu Saga Barley Shochu, fresh raspberry, blueberry, and strawberry, elderflower liqueur, topped with sparkling chardonnay. Sounds like a refreshing way to end a Golden Week! For more information, follow their Facebook event page.